The Hell's Vengeance Adventure Path begins with "The Hellfire Compact," an exciting new adventure in which the players take the roles of evil characters in the diabolical empire of Cheliax! A paladin of Iomedae and knight-errant of the Glorious Reclamation comes to the town of Longacre, inspiring the citizens to join the uprising against the Thrice-Damned House of Thrune, First as amoral mercenaries, then as retainers of the wicked archbaron of Longacre, the evil adventurers must move quickly to put down the insurgency and keep the town from falling to the knight's rebellion. 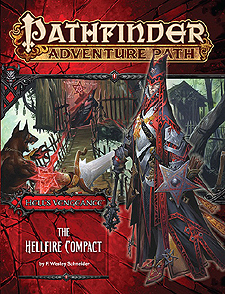 "The Hellfire Compact," a Pathfinder adventure for 1st-level characters, by F Welsey Schneider. A bestiary of frightful new monsters, by Paris Crenshaw, Mikko Kallio, and Jason Keeley.